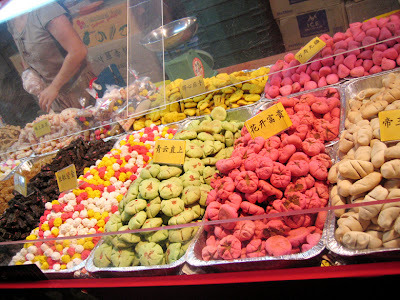 With Chinese New Year just round the corner, I couldn’t resist a visit to Chinatown. Besides, I had every reason to go there last Sunday since I was playing tour guide to Urzsula and Janet. Both girls are international exchange students I met at SMU. Urzsula’s from Poland, while Janet reigns from Holland. They were so much fun and I pretended to be a tourist and started snapping some photos. It’s nice to capture the Chinatown spirit during Chinese New Year. 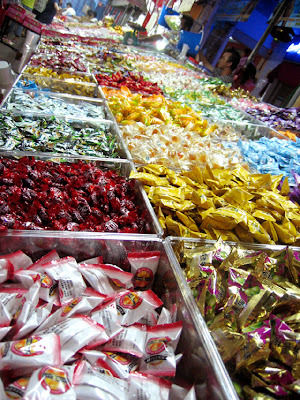 Though crowded, the buzz at Chinatown provided for a truly local experience. Both girls got a glimpse of the huge appetites and ‘patience’ of Singaporeans – the long queue for Lim Chee Guan’s bak kwa (barbecued minced pork) said it all. What entrances me every time I visit Chinatown during this festive period is the splash of colours that line the countless makeshift stalls. You almost feel as if you’re in another part of Asia. Or perhaps it’s just that I’m very much a visual person and can’t resist taking in the rainbow that stands before me. Sweets are a common sight at Chinatown. 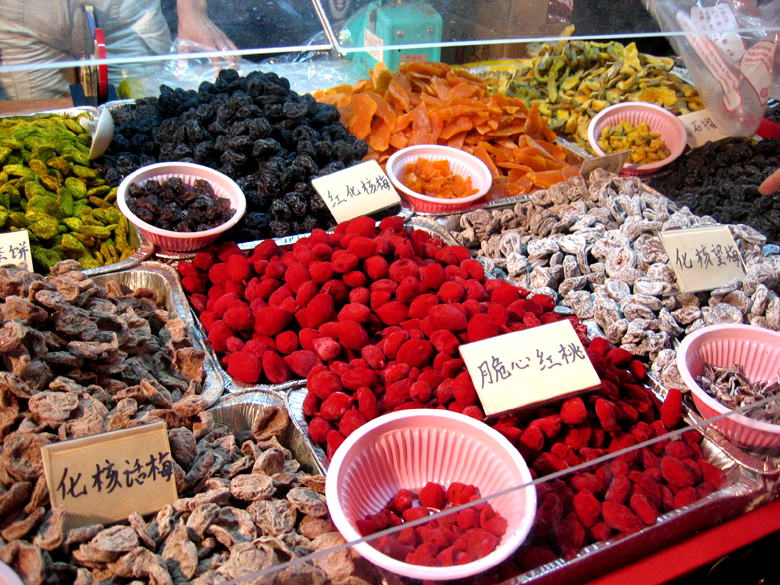 There’s no shortage of mochi sweets, preserved fruits & chocolates. Sold by the grams, it’s just so tempting to grab every single colour and every type. I had to stop myself from picking too much. In the end, I bought $5 worth of those Japanese mochi sweets. They’re really chewy and come in so many flavours – durian, honeydew, chocolate, yam, strawberry, green tea, etc. I love the green tea one. After much exploring and squeezing through the crowds, us trigger happy girls decided to drop by People’s Park Food Centre to appease our tummies. 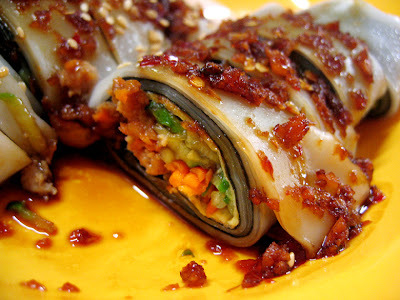 That chee cheong fun ‘sushi’ roll was the most interesting fusion thing I have eaten so far. It wasn’t my first time trying it. Thing is, everytime I ate it, I forgot to take a photo of it. So now I shall share this piece of goodness with you. Urzsula and Janet loved it. They were rather amused I must say! Urzsula tried the Almond Soya Milk from Mr. Bean and I think she liked it. Okay, here’s the thing, I’ve been telling her how wonderful the soya milk here is. The soya milk she’s tasted before were not so fantastic I guess! But here, soya milk’s everywhere and I guess she got curious. Anyway she thinks that the Almond one is tasty. It was a really breezy evening and the three of us took a walk after dinner and snapped more shots of the beautiful light-up. Beautiful end to the week I think. I’ve invited Urzsula for a homecooked meal some time soon and will definitely post about it. hey hey… it’s okay 🙂 I use a simple point and shoot camera – Canon Ixus 500. Hope that helps! The chee chong fun is insane! My mom and I had it couple of weeks ago and it was surprisingly delectable. They have a pork floss version as well. Hi! May i know where is the chee chong fun ‘sushi roll’ stall located? heh it looks sooo yummy! my hubby n i luv roasted duck. but it’s been years since we last enjoyed one coz it’s difficult to find halal duck meat anywhere in spore. 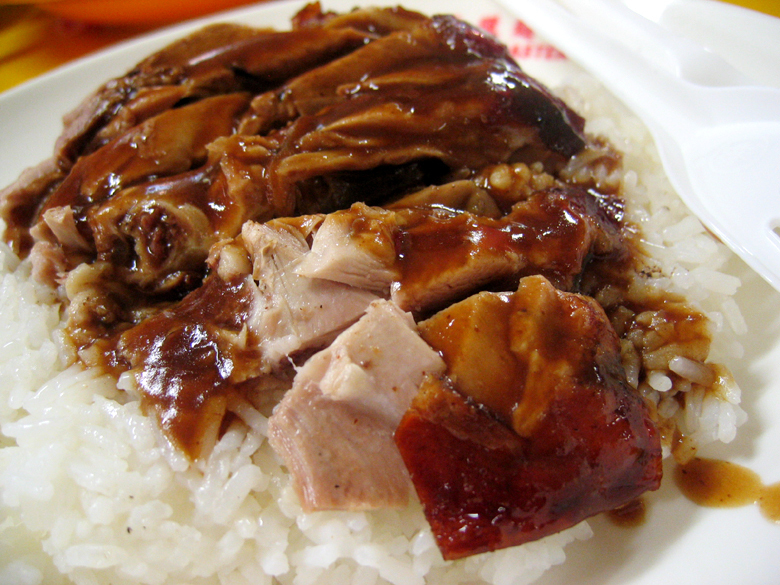 if u come across any plc selling these halal duck meat, pls post the yummy details on your blog. oh and marina square has really good roasted duck. ate it before? ah..lucky girl, i wish i was back for the chinese festivities. ahhh! ur really in SMU for exchange! twice, i thought i saw someone that really looks like you.. now i know its you! Hey baker. That duck rice you tried? Is it by any chance that the name’s “Choo Chiang Roasted Ducks & Cooked Foods” ? ?